The Olympic opening ceremonies celebrated Britain’s National Health Service as one of the country’s great achievements. Fox News, which reviles “Obamacare” as an evil Commie plot even though it’s a whole lot weaker than Britain’s universal-coverage system, found this somewhere between baffling and horrifying. As the mouthpiece for the religious right, it's no surprise that Fox News has weighed in over the Chick-fil-A controversy. Right wing Christians, in protesting evil secularists who aren't happy about this "family values" chain setting up shop in their neighborhoods, are taking up the cross of Jesus along with buckets of Chic-fil-A chicken in support of a company that has associations with radical homophobic hate groups. In support of their holy chicken loving fan base, Fox has featured several discussions which, while reasonably fair & balanced, don't feature the connection of Chick-fil-A's owner, Dan Cathy, to radical homophobic causes. Rather, the Fox talkers defend the restaurant's owner's homophobic comments as just his opinion, so no big deal. (Course when atheists say something that Fox talkers don't like, it's a different story!) So in keeping with the Christian connection to the controversy and the patented Fox persecuted Christian meme, this morning's Fox & Friends asked if anti-Chick-fil-A comments are "a threat to Christianity." Really? Cavuto: I'm Beginning Not To Recognize The U.S.
Neil Cavuto fear mongered about the state of the country - with a litany of worries about taxes, universal health care, not enough cutting, etc. It left me worried about what kind of country he'd like to make us into, in the name of "restoring" it. Just in time to get Mitt Romney out of his foot-in-mouth mess in England, Neil Cavuto trotted out international security expert Aaron Cohen (who so happens to have a book published by another News Corporation subsidiary) to say Romney was quite right in his doubt and concern about whether England was adequately prepared for the Olympics. Cavuto was so onboard with the threat level, he said he couldn’t understand why there had been any fuss about Romney’s comments in the first place. After the president of the chicken chain, "Chick-fil-A," Dan Cathy, made a recent comment in support of "traditional marriage," there has been "a firestorm of public debate." Those who support gay rights are supporting a boycott. The mayors of Boston and Chicago have expressed the desire for this restaurant to stay out of their cities. The Christian right, in making it a sacred cause, are stuffing as much Chick-fil-A down their copious gullets as they possible can. Even the Muppets are involved. Not surprisingly, as the media mouthpiece for the Christian right, Fox News is stepping into the imbroglio. As reported by News Hounds Ellen, Mike Huckabee is crusading for Chick-fil-A. And On last night's "Factor," Bill O'Reilly and Laura Ingraham dissed those who are dissing Chick-fil-A because saying that gay marriage is inviting God's wrath is no big deal. And in their attempt to defend Mr. Cathy, they left out some inconvenient truths regarding the extent of his homophobia. No spin zone, indeed! 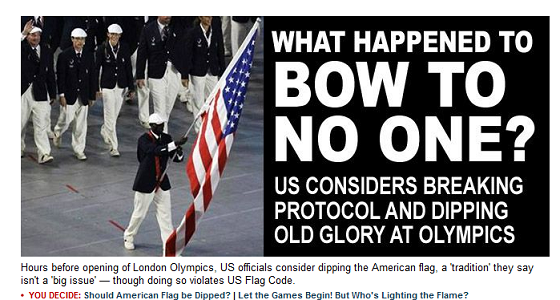 No, the US Olympic Team will not dip the flag to the Queen of England and other dignitaries at the opening ceremonies: but even the hint that it might occasioned another Outrage Piece from Fox’s culture warrior Todd Starnes. An hour later Fox News had made it the leading headline on their Web site. Some things are just predictable- Death, Taxes, The Tides and Mike Huckabee’s endorsement of homophobia. He’s actually slated a Chick-Fil-A Appreciation Day for the first of August. Naturally, that received the approval of the franchise’s founder, Truett Cathy, on the last Huckabee show (video after the jump). As Mitt Romney bombed in England, Bill O'Reilly held a chat with John Sununu, a Romney surrogate, about the Republican candidate's dismal likeability ratings. Not that they brought up any of his stunning gaffes that led the British press to characterize him as "worse than Sarah Palin." No, O'Reilly and Sununu kept their discussion to a recent poll that found Romney's likeability ratings in the tank at 30% - with President Obama's at 60%. "Independent" O'Reilly acknowledged that that's a problem for Romney and asked Sununu what could be done. Which is pretty funny given how most everyone (except on Fox) was thinking yesterday about what Romney should not be doing.